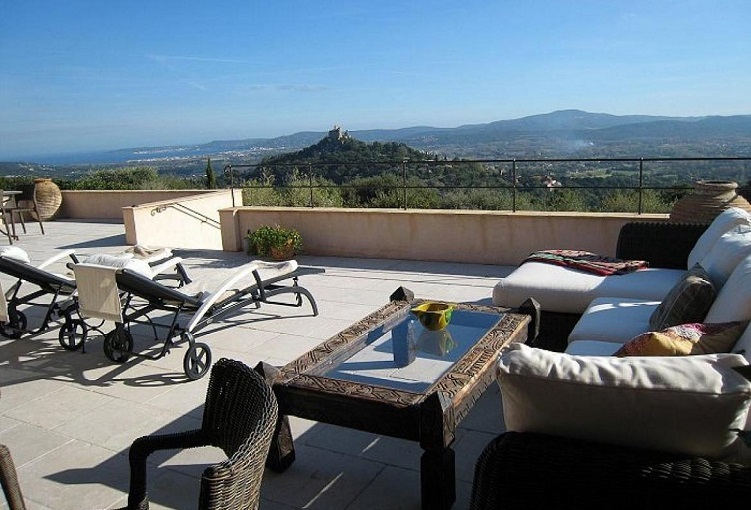 This elegant villa is set in a wonderful location with exceptional views over the ruins of Grimaud castle and distant sea views of St Tropez Bay. 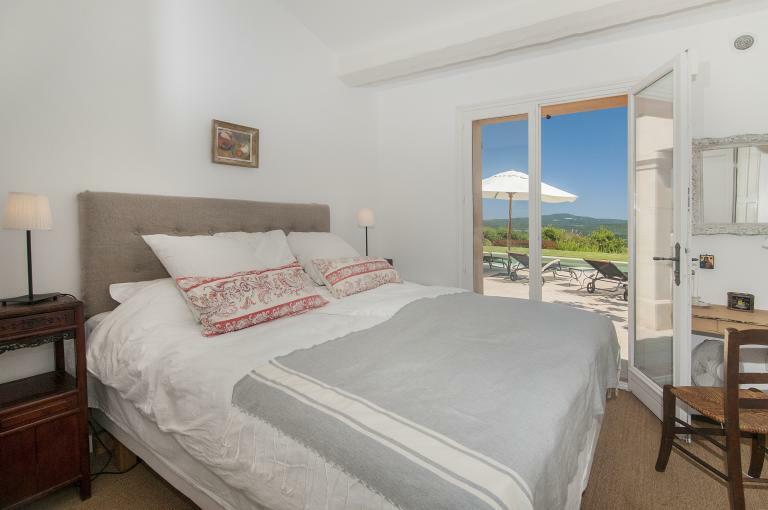 Each bedroom opens onto the garden and pool as well as having its own bathroom. 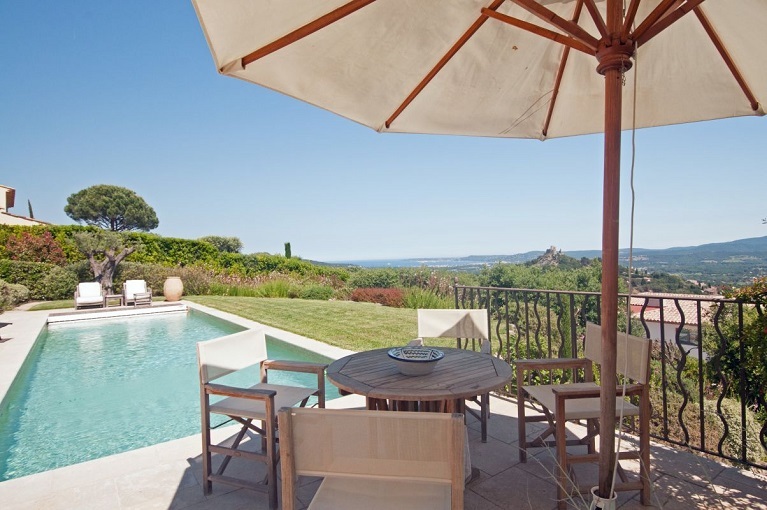 The property is situated just 1500m from the charming village of Grimaud with easy access to a small selection of shops, restaurants and bars, and within a short drive of the beaches around St Tropez Bay including Port Grimaud, Sainte Maxime and a little further in Saint Tropez itself. 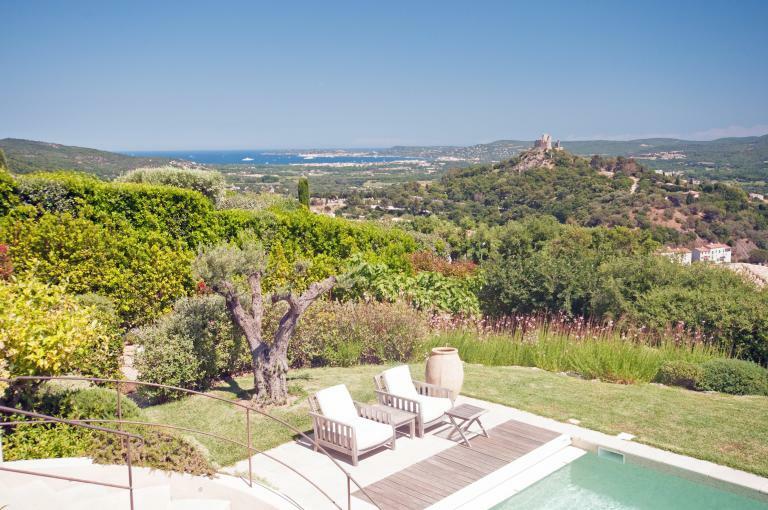 The village of Grimaud is set just inland from the hustle and bustle of the coast, with charming narrow streets nestled at the foot of a ruined castle which offers spectacular 360-degree views (a visit just before nightfall to see the sunset is highly recommended). Grimaud comes alive during the summer with the Grimaldines Festival held on four separate days over a four-week period. The festival attracts artists from all over the world offering free street music as well as evening concerts in the castle’s open-air theatre. 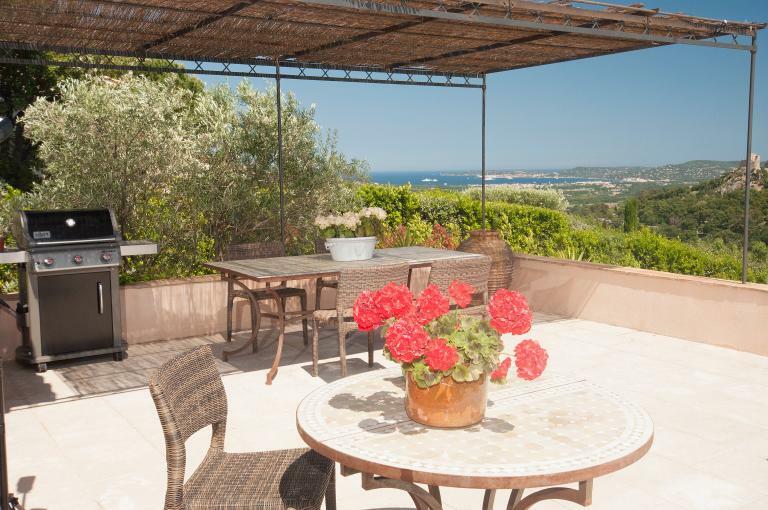 Villa Bellevue is also close to many other delightful inland villages such as Plan de la Tour, La Garde Freinet, Gassin and Ramatuelle as well as a number of coastal resorts including La Croix Valmer and Cavalaire. There is a wide range of outdoor activities within easy reach including walking in the surrounding hills, tennis, golf, go-karting as well as water sports on the coast. Living area Ground floor (entrance level). 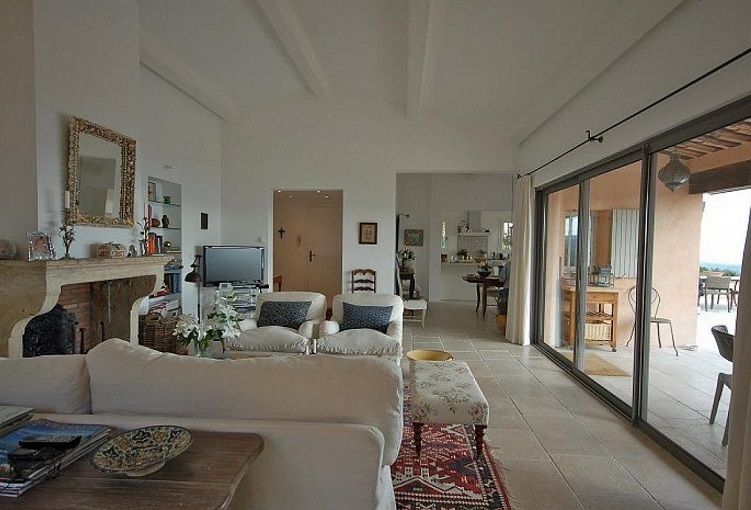 Living room with sofa, armchairs, TV, DVD player, hi-fi and fireplace. 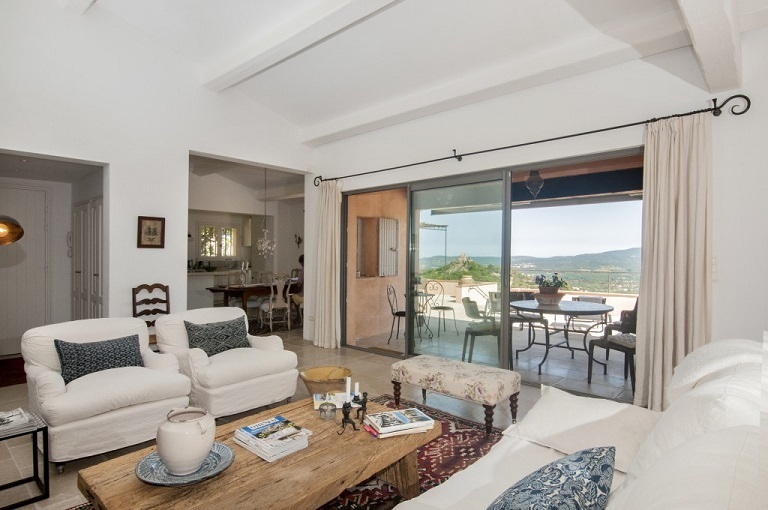 French doors lead to furnished terrace with views over Grimaud Castle and sea views. 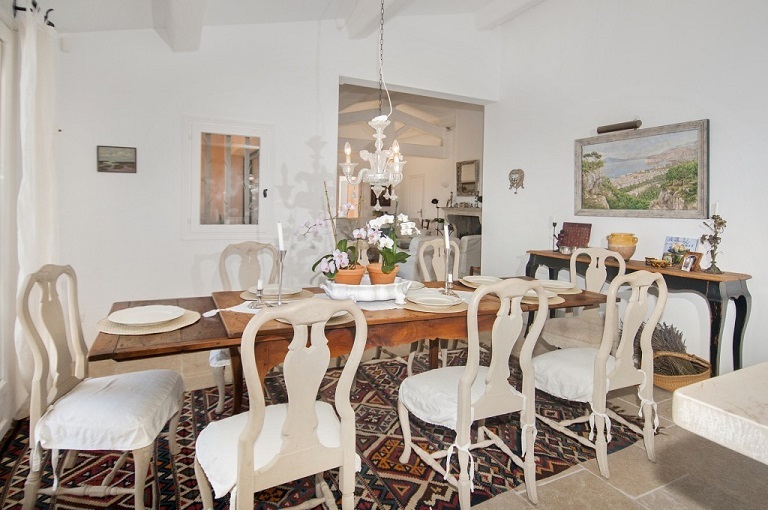 Separate dining room with table and chairs. 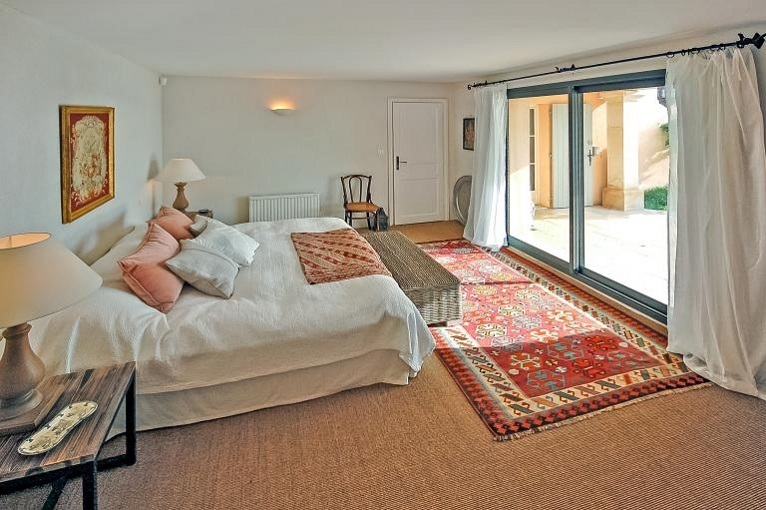 French doors lead to terrace. Kitchen Ground floor (entrance level). 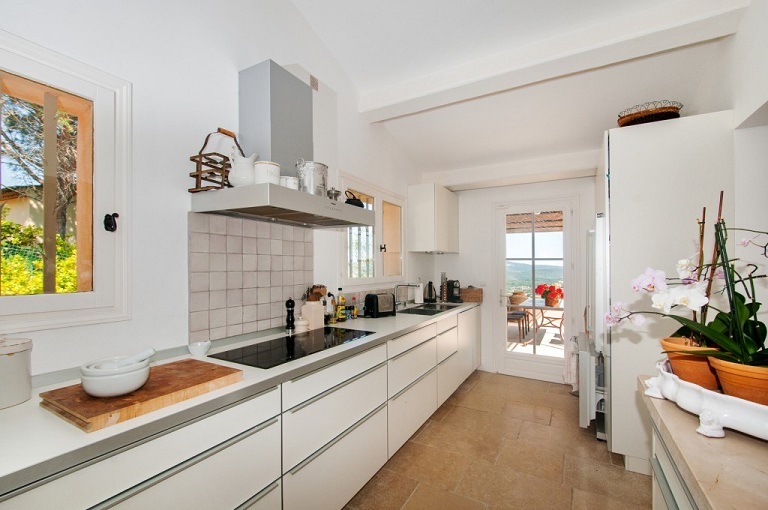 Modern kitchen with dishwasher, oven, microwave, induction hobs, American fridge, kettle and coffee machine. French doors lead to covered terrace with dining facilities and barbecue. Utility room with washing machine. Bedroom 1: Double bedroom with super King size bed (200cm). French doors leading to pool and garden. En suite shower room. Bedroom 2: Double bedroom with King size bed (180cm). French doors leading to pool and garden. En suite bathroom. Bedroom 3: Double bedroom with Queen size bed (160cm). French doors leading to pool and garden. Separate shower room. Bathroom(s) Lower ground level: En suite to Bedroom 1 with shower room with wc. En suite to Bedroom 2. Bathroom with bath and wc. 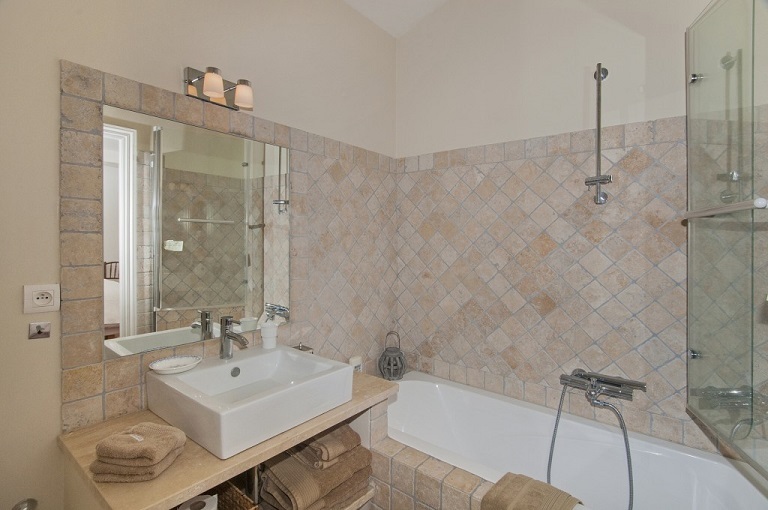 Separate shower room with walk-in shower and wc. Hair dryer. Exterior Enclosed and well-maintained gardens. 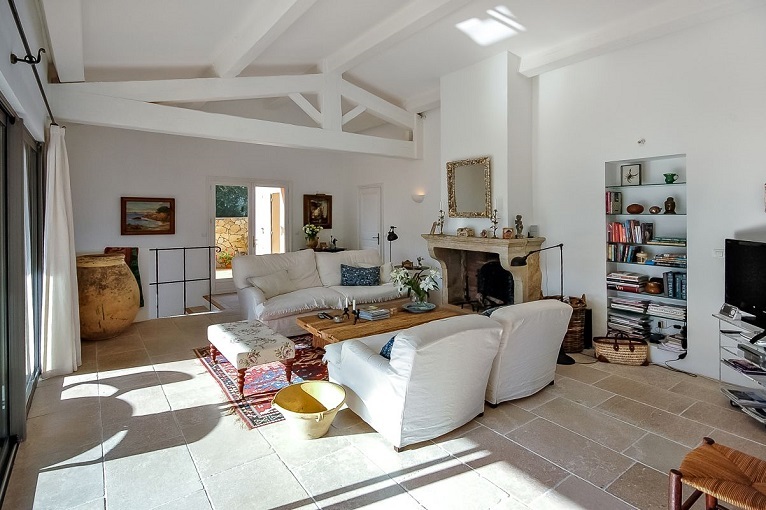 Large partly covered terrace off the living room and kitchen with barbecue and outdoor furniture. Low wall and care must be taken with young children. Steps down to the pool on a lower level. Six sun loungers. Ample parking within the grounds for three cars. Pool Private pool: 13 x 3.5m, depth 1.6m throughout. Security system: Cover. Steps. Changeover day Saturday. Check-in between 4-8pm. Checkout before 10am. Other charges Refundable security deposit: 400€ (£350) payable with final balance. The security deposit will be returned once an inventory has been completed and shown that that no furniture, fixtures, fittings or linen is missing, damaged or soiled. The security deposit will then be refunded by bank transfer within five days of departure. Other information Cot (including cot linen) and high chair available. Please request at time of booking. Nearest airport(s) Nice 90 minutes (105km), Marseille 90 minutes (133km). 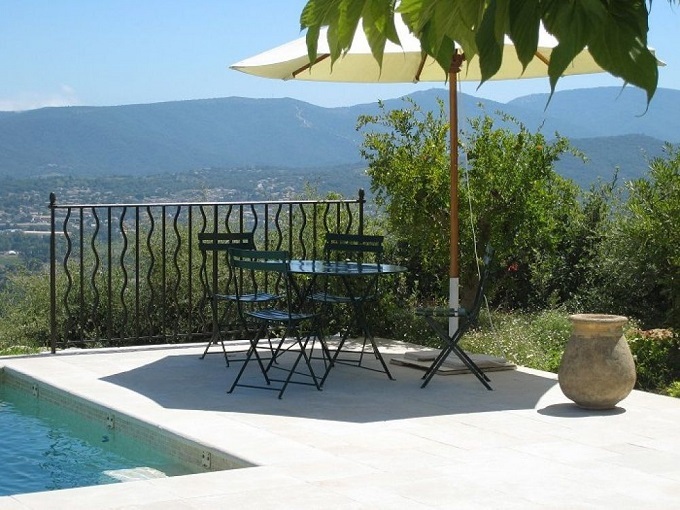 Shops Bakery, butcher and other shops, restaurants and bars in Grimaud 2km. Supermarket 3km. Tuesday and Saturday: Saint Tropez (13km). Regular boat trips to St Tropez. 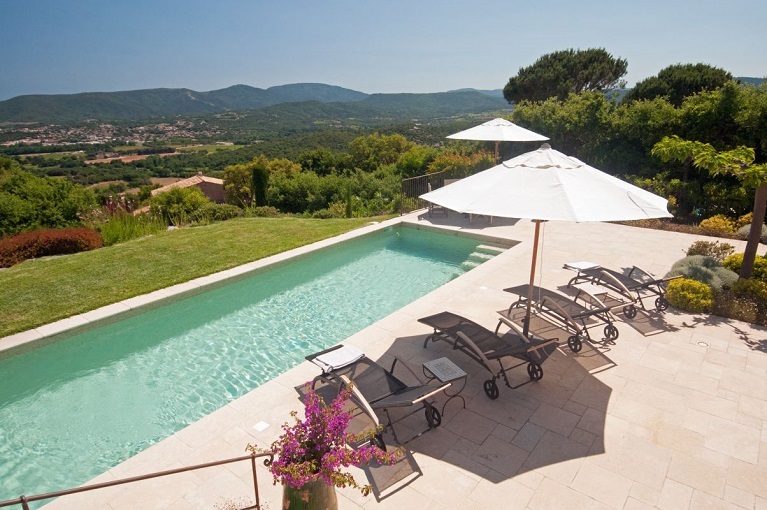 This is a great way of discovering St Tropez without the hassle of having to park your car or getting stuck in traffic. Crossings take 20-30 minutes and costs around 13€ per person return from Port Grimaud. Water park: Aqualand Sainte Maxime (16km). Seasonal, outdoor park featuring waterslides, a splash area for children and a swimming pool. Larger water park in Fréjus (32km). Tree top Adventure Park: Provence Aventure: (28km). Set in a beautiful oak forest, on the banks of a river. There are a number of routes for everyone to enjoy depending on age and ability as well as a spectacular zip line 250m above the river. Zoo: Parc Zoologique Fréjus. (40km). 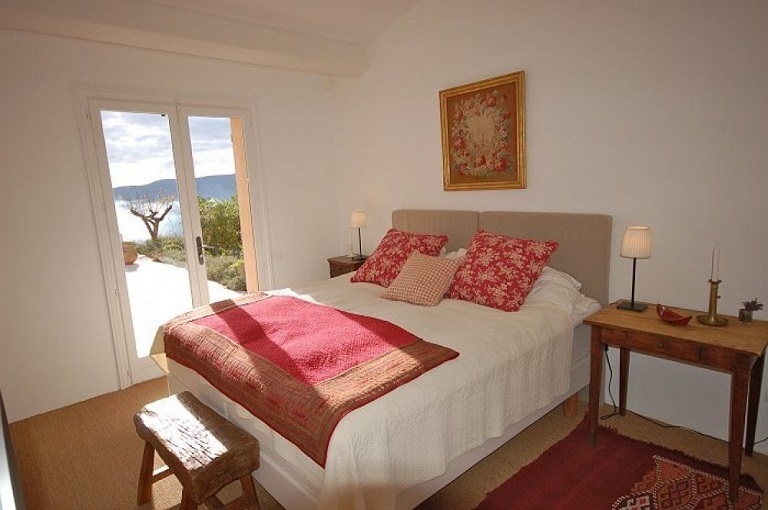 Situated in the foothills of the Esterel Mountains, the animal reserve of covers 20 hectares and is visited by car. There are elephants, zebra, primates, pink flamingos, wildcats and many more. Golf: Grimaud and Cogolin: (5km) Tennis (5km).